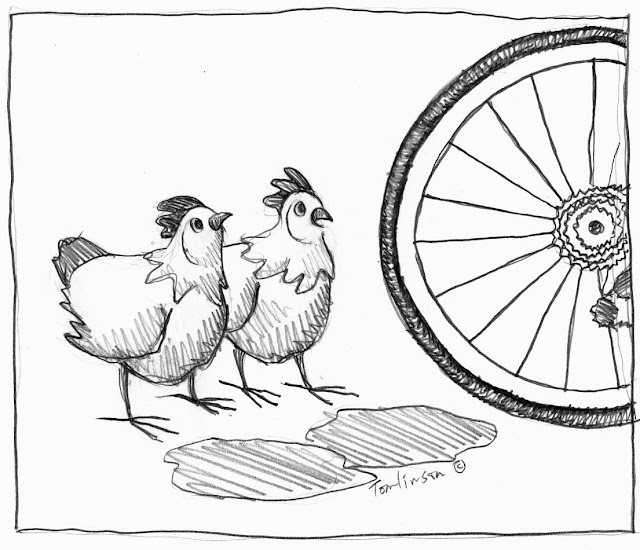 "At a minimum, I say we insist on training wheels." I'm with Gail...not sure how I missed the girls at City Council, but I have to tell you Pearl and Henrietta are the highlights of my Friday mornings now! Thanks, y'all. The city council cartoon is one of my faves, too. Susan, I'm just now getting acquainted with Pearl and Henrietta, how charming! I've gone back through some of their previous antics on your blog, and I adore them! I'll be sure to stop in more regularly now. They're wonderfully funny and adorable! I think they will both fit very neatly into a basket on the front of your bike. CVF--Welcome! I'm glad you enjoy the chickens.